Poll: What should we add for the next update? The Sensei & Son HD128 Minecraft Texture Pack is a high resolution realistic looking Minecraft Resource Pack with a medieval martial arts influence. 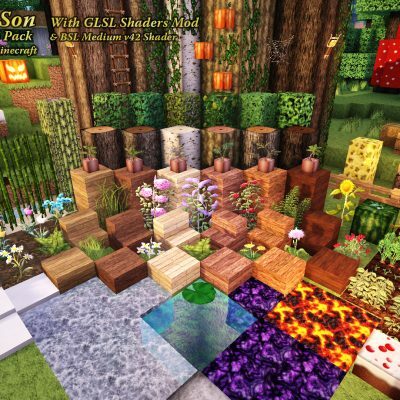 The Sensei and Son HD128 Minecraft Texture Pack makes use of MCPatcher for custom CTM connected textures for seamless glass and full alpha transparency for glass, water and fire. I even created custom Filter Forge filters to generate the animated textures: DLI_WaterFlow, DLI_FireFlow and DLI_LavaFlow. The Sensei & Son HD128 Minecraft Texture Pack is also compatible with Optifine which has similar features. Please visit the official Sensei & Son HD128 Minecraft Texture Pack web page for more information about the texture pack, lots more samples at high resolution including many in-game screenshots, videos and DOWNLOAD LINKS for the new 1.8+ version as well as for the original 1.7.10 version. Please use this forum for comments and discussion. Let me know what you think. Thank you and enjoy! 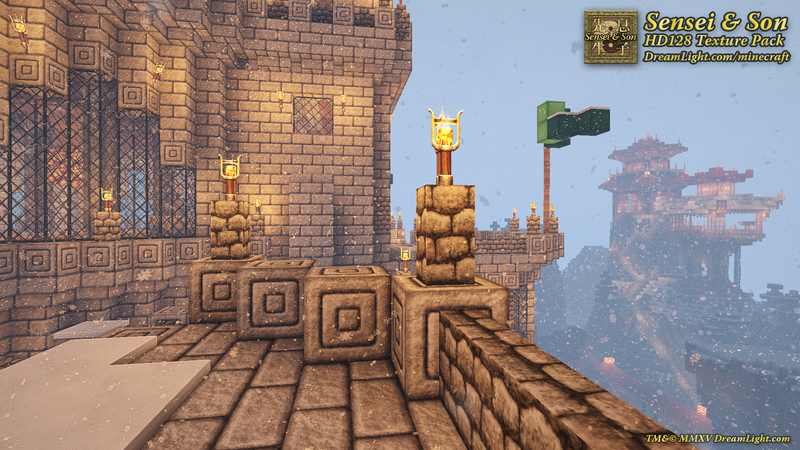 This new Sensei & Son HD 128 1.8 version 2 of the texture pack is optimized for Minecraft 1.8+. 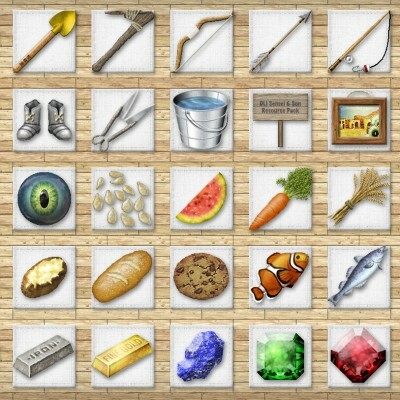 It includes textures for all the blocks and items for Minecraft 1.8.9 as well as all the new banners. It works in later versions of Minecraft as well but will lack textures for blocks and items introduced after Minecraft 1.8. If there is enough interest in the texture pack we'll extend it to cover newer versions of Minecraft as well as other areas of the game that are modifiable in Minecraft Resource Packs such as texturing the mobs, creating new custom models, redesigning the graphical user interface (GUI), customizing sounds, etc. 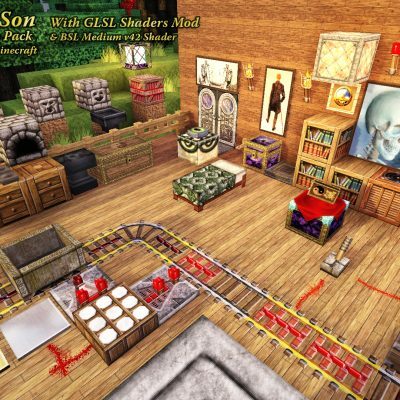 Here's an awesome and humorous independent showcase/review of our Sensei & Son HD128 Texture Pack! Here’s a short walk-through / fly-by video that my son MJ (Minecraft avatar guigee) put together showing the Sensei and Son HD128 Minecraft Texture Pack being used with Optifine and a GLSL shader mod, Sildur’s shader pack. He walks-through and flies-by some of the areas we’ve developed on our online Minecraft server during the process of creating and testing all the various textures. My Minecraft avatar SenseiMS even makes a cameo appearance in the video. This video is available in HD720p, so if you have a fast Internet connection you may click on the gear icon and change the quality to 720p for the best view. 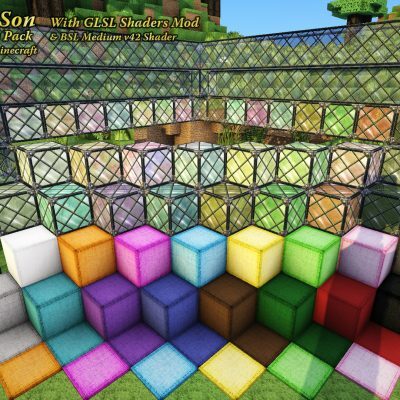 While plain vanilla Minecraft or Optifine and any GLSL shaders may be used, the Sensei and Son HD128 Minecraft Texture Pack is optimized for use with MCPatcher which provides additional functionality. Plain vanilla Minecraft and Optifine don’t have support for multiple render-passes which are available with MCPatcher’s Better Glass mod or full CTM connected texture mod support. If using Optifine, glass blocks will appear opaque and won’t connect into seamless panes. Pane glass will connect seamlessly but will appear totally transparent other than the frame. With MCPatcher glass blocks will seamlessly connect, they will be semi-translucent and pane glass will also appear semi-transparent between the seamless frames as well as in the wooden and iron doors. Fire, smoke and water will also appear translucent while fully animated. While GLSL shaders are most often used with Optifine, they may also be used with MCPatcher instead. 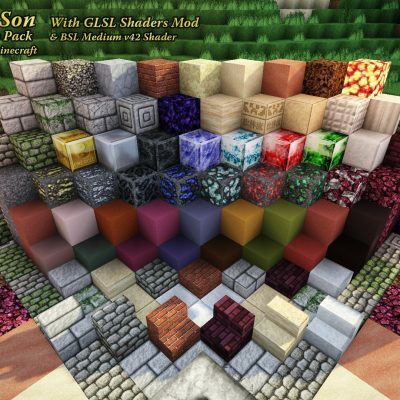 In that case all the features of the Sensei and Son HD128 Minecraft Texture Pack will be available even when using optional GLSL shader packs. We've updated all the screengrabs with GLSL Shaders installed. Makes a huge difference in the level of realism in the rendering of all the textures. Check em out! Here's a link to our new step-by-step instructions on how to install the GLSL Shader Mod and Shader Packs with MCPatcher using Minecraft Forge. Looks nice, clean and detailed. Love it. Would be neat to Update to MC 1.8.8. Hope we can see Support for Mods in the Future. In the mean time you can stack it on top of another pack that handles mobs and the new blocks/items for 1.8 in Minecraft's selected resource pack stack list. That way it won't be quite so jarring when you come across any new blocks/items or mobs. I added a poll to see what everyone thinks should be added first for the next update, new blocks & items for MC 1.8 or mobs for MC 1.7.10. Please take the poll and let us know what you think. I've added a short walk-through / fly-by video showing the Sensei and Son HD128 Minecraft Texture Pack being used with Optifine and a GLSL shader mod, Sildur’s shader pack, to the original post. That uses Optifine and shows a few glitches, like opaque torch smoke and water. The texture pack is optimized for MCPatcher so I've also added a link to step-by-step instructions on how to install GLSL Shader Mod and Shader Packs with MCPatcher using Minecraft Forge to get the full benefit of all the advanced features using MCPatcher with the optional GLSL Shader Mod and GLSL Shader Packs. I've posted more screenshots using the texture pack and GLSL shaders in a new thread about some of the builds we made on our test server as we were designing and testing the textures in-game. -Enjoy! I've also started a new thread where I'll post some of the texture templates that we used while creating this texture pack in order to help others who may wish to create their own texture packs. I found that one of the items was failing to load. The apple was failing to load (easily seen when opening the inventory in creative mode which has an apple in the lower left corner). The filename started with an uppercase 'A' which caused it to fail to load. I've renamed the file to all lowercase, repacked the zip and uploaded it as version 1.7.10_1. So if you've already downloaded the texture pack you can either download it again to get the updated version with the correct filename or simply edit the name of "assets/minecraft/textures/items/Apple.png" to "assets/minecraft/textures/items/apple.png" with all lowercase. Then it should load correctly. New 1.8 stuff would be awesome! Yes, a 1.8 update would be next if there's enough interest, so spread the word! That's strange. The pages load here, where are you located? They may be blocked in Russia/China due to all the spam we were getting. Here's a direct download link that should work though. I added it to the OP as well. Thanks for pointing it out. SenseiMS, thanx for direct download link, that worked for me! I'm located in Russia and dreamlight.com is unavailable for me (checked on different computers with different internet providers). I'm glad you were able to download it from the direct link and that you like the texture pack! -Enjoy! Wouahhh this pack looks very nice... I love this medieval and realistic style. Thanks. Such feedback is always welcome and appreciated! I did a showcase on the Resource Pack. Awesome job! Cool, thanks for the awesome review! It's very much appreciated! I added a link to this showcase/review to the OP and the Sensei & Son HD128 Texture Pack page as well. Nice video about our resource pack! This is a block update. 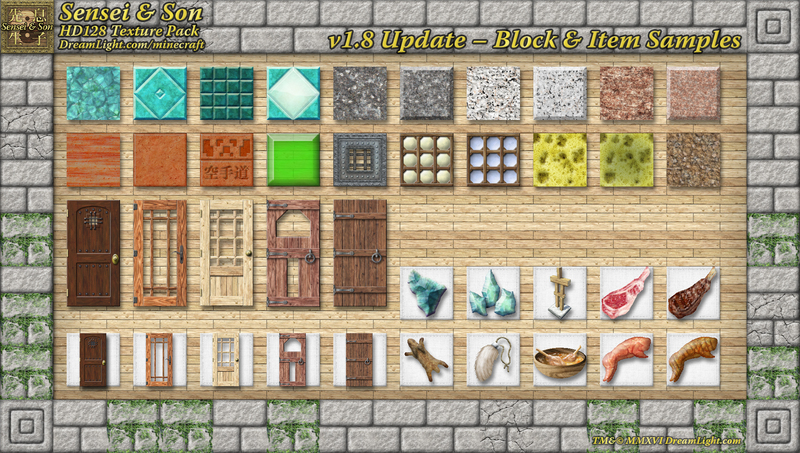 It adds textures for all the new blocks up to Minecraft 1.8.9 such as prismarine, sea lantern, new doors, new stones, etc. and a few of the new items such as matching doors. It also adjusts some of the glass and a few other blocks to work better with 1.8+. We'll post a subsequent 1.8v2 item update when we finish the rest of the items. Download it and give it a spin. Let us know what you think. Enjoy!